Kaylan Reid Shipanga, the author and native New Yorker who lives abroad in Namibia. BASKING under the warmth of my air conditioner’s ‘heat’ function, I sip on a cup of raspberry herbal tea. It’s June and I’m ushering in another winter season in the southern African nation of Namibia. Africa is often stereotyped by the relentless humidity and heat of it’s western nations, but temperatures in many parts of the continent can dip surprisingly low. Yes, there are actual ‘winter’ seasons in many African countries. In southern African countries, a winter hits from about June to August. Nights and early morning temperatures in Botswana, South Africa, Swaziland, Lesotho, Zimbabwe, and Namibia (where I live) can even go close to freezing. I cracked up the other day when a Namibian Facebook friend of mine visiting South Africa posted, "JOBURG IS DAMN COLD!" Depending on your elevation, temperatures in Kenya can drop below 50°F (10°C). North African nations like Tunisia and Libya also experience pretty chilly weather, where temperatures sometimes struggle to reach 50°F. From the insane temperature drops to lugging around a winter coat on an 80 degree day... my eight winters in Namibia have taught me a few things. Here's what I've learned about life in chilly African weather. 1. You will have to dress for summer during the day and winter at night. It’s not odd for some African nations to have a high afternoon temperature in the 70s or mid 80s fahrenheit but then have a massive drop to the 30s and 40s at night during their winter months. This can make choosing your outfit a bit tricky, particularly if you have an entire day of events. Dressing in layers is key! 2. Folks love to have outdoor events during the winter season. For the most part winter in America means way less outdoor activities. As wintry weather shuts us in we eagerly await the arrival of spring and summer. But I’ve noticed that in Namibia outdoor events during winter seem to thrive. With the cold nights comes ‘bush parties’, braais (barbeques) and outdoor music concerts. People come donned in their cute winter wardrobe and really enjoy themselves. Somehow it seems the crisp weather adds a special element to outdoor entertainment. 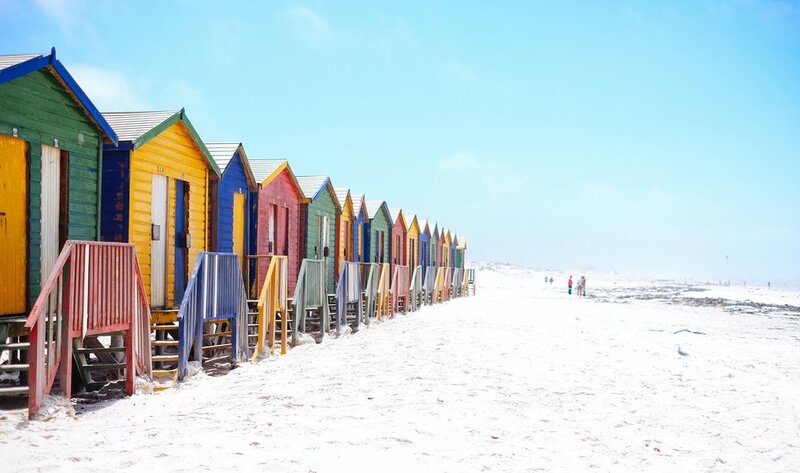 Don't be fooled by Cape Town's white sandy beaches. They can get really cold! 3. Don’t feel weird bringing a comforter to an outdoor event. I once attended a Zahara concert concert in the middle of Namibia’s winter season. When I asked my husband (then boyfriend) about how warm I should dress he told me my light sweater would be more than fine. I thought the concert would begin in the afternoon but it didn’t really kick off until the late evening. It was then that I started to notice people arriving dressed in winter coats and lugging entire comforters with them… and when the chill of the evening hit people were actually wearing their comforters. I was so freezing the entire night that I barely enjoyed the concert and we had to leave early. To this day I will not let my husband live that down! 4. Indoors can get colder than outdoors. On several occasions I’ve noticed that for some reason during Namibian winter afternoons the indoors of some homes and buildings are actually cooler than outdoors. I remember my volunteer house being downright frigid while outside felt like a mild 82 degrees farenheit. Perhaps buildings here are constructed to stay cool during the heat of the summer months which makes sense as they dominate the year. Thankfully space heaters are commonly sold this side of the continent, of which I have purchased several. They really come in hand during chilly mornings as you wake up! 5. I didn’t need to pack much winter gear with me when I moved here. When I first relocated to Namibia I definitely knew about the winter season. And so I packed a ridiculous amount of winter wear accessories… fleece jackets and pants, a sleeping bag, hats, scarves, coats… the works! All of this of course weighed my luggage down. What I didn’t realize was that I could’ve easily purchased everything from Namibian clothing shops because they sell all the same stuff here. Just like in the States, Namibian retailers go into winter mode and fill their racks with cold weather gear as the cool season approaches. 6. Some Africans will assume I’m used to cold weather. If I had a dollar for every time a continental African said I should be used to the cold…! A lot of people think that an American is automatically comfortable in lower temperatures due to our geographic upbringing. Nope! What they don’t know is that winter is what so many African Americans are constantly trying to get away from. For most of us, cold just doesn’t agree with our DNA. Escaping East Coast winters was a major deciding factor in my relocation to Namibia. No shame there. Like clockwork, there's a noticeable uptick in coughs and colds whenever Namibia's winter hits. The days are generally warm and balmy. But it turns out those 40 degree temperature drops each night wreak havoc on the body. Basically, everyone and their mama seems to catch a cold bug during the winter season. Keep your system strong with an immune booster like shark liver oil or Flugon (sold around Africa) and hope for the best. I still wouldn't trade African winters for AMERICAN ONES! A self-proclaimed child of the sun, cold on the continent was not something I've ever been that excited about. Yet, I’ve surprisingly managed to find some solace in winter in Africa. For a few months I get a break from the oppressive Namibian sun and the insects seem to migrate elsewhere which means fewer mosquitos. And the evening get togethers by fire are actually kind of cozy and make for some good memories. I'll take an African winter over a New York one any day!